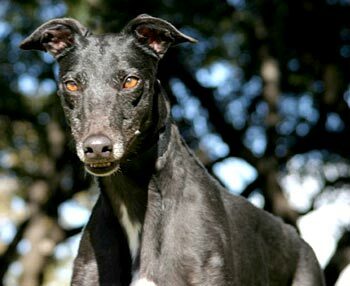 Gabby, aka Jabboty, is a 4½-year-old black female born August 12, 2005. Her sire is Gable Tabasco, making her grand sire Gable Dodge, and her dam is Kiwi. 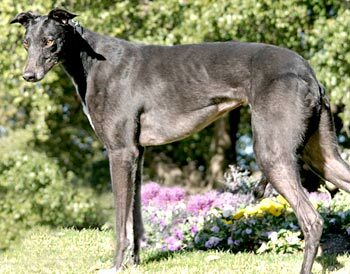 Gabby has no races to her credit on Greyhound-Data.com, although she broke a toe on her rear right foot while racing at Gulf Greyhound Park in LaMarque, TX. Her toe is all healed, and you would never know it happened! No cats for Gabby: Gabby showed quite a bit of interest in the cats. She would move on to look at other things in the house, but always came back to the cats with ears raised and too much interest. I would not trust Gabby with cats. We will introduce her to small dogs at a later time (maybe after she is placed in a foster home). Gabby is a very small, shy female who will need a quiet home to call her own. She is fearful of men, and although she seems to want to approach them, she has trouble actually reaching out to them... Her ideal home would be with a single female. Gabby is a lover once she knows you will not raise your voice or otherwise scare her, and will happily kiss and snuggle with you (preferably on your bed!) and toss her stuffies for your entertainment. She has a very good appetite, so can be encouraged to trust with food rewards. She smiles (!) when feeling secure and loved, and would do best with another dog as a guide, comfort, and companion. Please consider opening your heart and home to this gentle little girl, she really needs someone to love, and to be loved in return.